Kirito tries using the Blue Rose Sword. Selka finds trouble in the End Mountains. Episode 3 - "The End Mountains"
It looks like Kirito is going through another tutorial, but it's not as emotionally traumatic for Eugeo this time around. We're in the middle of world discovery, where Kirito the breaker tries to figure out how to abuse the system. I see a couple of things that might cause some trouble for how the system is supposed to work, that Kirito can exploit. The first is this Taboo Index and the Sentinels who supposedly tell the Integrity Knights who to arrest. Eugeo can't believe that Goblins are actually kidnapping people because that's against the rules, and the Sentinels are supposed to make sure people follow the rules. We saw that in the prologue episode, but at the end of this episode, there's a bunch of goblins knocking out poor Selka and about to kill Eugeo and Kirito for meat. So, where's the Sentinel popping out of the air to tattle on them? I can see an explanation that only humans in this side of the mountain are to follow the Taboo Index, while the Goblins are following their own rules. That's convenient, for the Goblins, but either real people have to defend the NPC artificial souls, or the souls themselves have to break whatever programming they got. The second thing I saw was what Kirito noticed about his character level and the Blue Rose Sword's level. He's a 38 and the sword is a 45. Many RPG's have class rules for monsters, items, and skills, so using that legendary sword might be useless until he or Eugeo levels up. Also, I noticed a discrepancy in the graphic for the sword info. If you look closely, it says its item type is a tree and it has the same total HP as the Gigas Tree, but with less current HP. That needs to be cleaned up for the blurays. This story is taking its sweet time, but we know that time is being greatly accelerated inside there, so who knows when or what is happening in the real world. We'll just have to appreciate how great everything looks inside Underworld for the meantime. Kirito is already a problem child. Stop oversleeping, or Suguha will get mad at you! This world looks great. Hello there, little squirrel bunny thing. Selka is Alice's little sister, which explains the emotional distance between her and Eugeo. This is convenient game plot development. Kirito showed up just when travelers and villagers are disappearing and people are blaming goblins. Whoa. 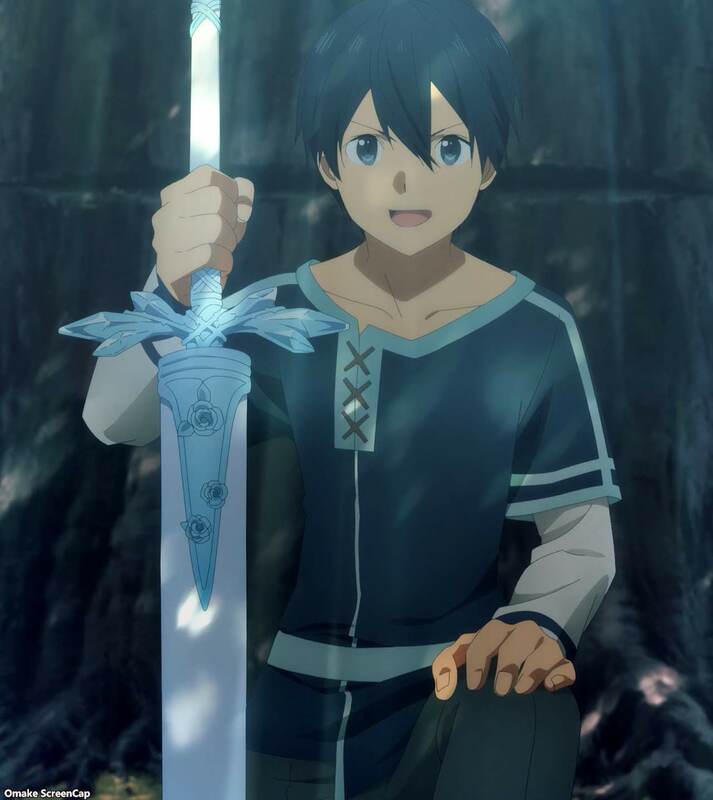 It took little kid Eugeo three months to drag that Blue Rose Sword from the mountains. Kirito had just used one-handed sword skills, so maybe he can't use two-handed any more? Eugeo did not have any glowing flashing thing happen when he swung the sword. This object class is too high for these kids. I wonder what Eugeo's class is compared to Kirito's 38. And that sword is apparently an item type "tree" with the same HP as the Gigas Tree. Nice going, guys. Eugeo said there was a plague three years before, explaining all the orphans. Was there some kind of artificial soul purge? New Chapter Quest - rescue Selka. 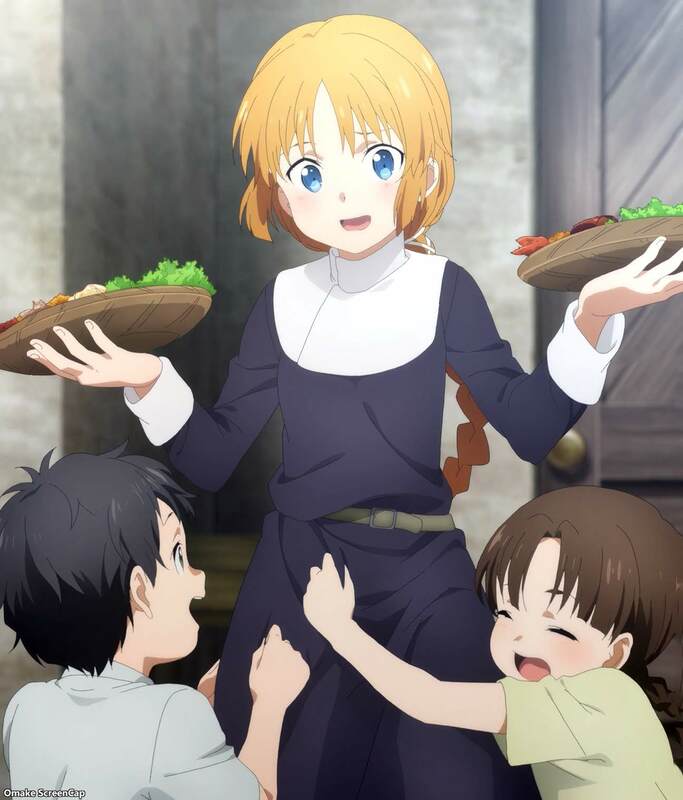 Eugeo better believe in Goblins now. Sounds like goblins - keep the women, kill the men for meat. So, how are these kids going to get out of this? They didn't bring any weapons with them, and the bits of treasure underneath the dragon bones looks gone. We'll just have to see next week.